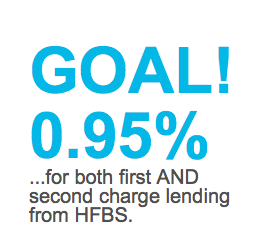 HFBS score with a 0.95% rate for both first and second charge lending helping brokers get one step closer to a done deal. Whilst year on year volumes have been on the up HFBS is delighted to confirm a further significant increase in funding. This will be reflected in a more aggressive use of our 0.95% monthly rate for both first AND second charge lending! Minimum loan size for this rate is to be dropped to £60,000 with a flexible view on moderate adverse taken and consideration given to commercial /semi-commercial at strong LTV’s. Together with our NO solicitor, incredibly quick completion, and second charge with no consent once again HFBS is taking a market lead.